See our range of Authentic Claddagh Rings, handcrafted in our very own workshop in Galway - the home of the Claddagh Ring. See our large range of Gemset Claddagh Rings in a large variety of styles set with dazzling colorful stones. A natural Garnet stone is the birthstone for January. See our range of beautiful Claddagh birthstone jewelry, handcrafted in Ireland. Exclusively designed and manufactured in Claddagh Jewellers, these exquisite rings are a unique and stunning take on the iconic Claddagh Ring. These stunning Claddagh wedding sets are made up of one of our exclusive diamond Claddagh rings with a sway wedding band. Tailor made just for you. Our dazzling diamond set Claddagh Ring range available in both silver & gold to add a touch of sparkle to your life. These intricate his and hers wedding bands contain both Celtic markings and the Claddagh emblem. Exclusive to Claddagh Jewellers . These handmade diamond set swayed wedding bands are designed to fit each of our exclusive diamond Claddagh Rings. Our handmade sway wedding bands are designed to fit around one of our diamond Claddagh Rings. The perfect wedding set. Our enormous range of Irish made gold Celtic rings contain a variety of patterns and motifs available in 9kt, 14kt & 18kt gold. Our sterling silver Celtic rings come in a range of styles and finishes, some with solid rose gold and yellow gold accents. The Trinity Knot represents the three promises: to Love, honor and protect. See our large range of trinity rings. The Celtic Cross is one of the most powerful and fascinating Celtic symbols. See our range of intricate crosses cast in gold and made in Ireland. We stock a large range of gold Irish and Celtic earrings in popular designs such as the trinity, the Claddagh & the shamrock. Beautiful Celtic necklaces cast in 9kt, 14kt & 18kt gold. Perfect for both casual and formal wear. Designed and made in Ireland. See the stunning Celtic Warrior Collection. Inspired by the Ardagh Chalice, perfect for all of you Celtic Warriors. Take a little piece of Ireland wherever you go with one of these beautiful Irish made beads. Treasured memories with Tara's Diary. See the beautiful Jean Butler Collection. Classic Celtic designs by the lady of the River Dance. This beautiful 10kt yellow gold Celtic wedding band embodies a stunning Celtic Knot Spiral design. "Le Cheile" means "Togetherness" in Irish and is a beautiful symbol to mark the rest of your lives together. Claddagh Jewellers – The Celtic Jewellery Specialists – From Galway with Love! Céad míle fáilte romhat! We welcome customers from near and far to thecladdagh.com. 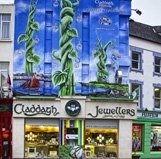 Claddagh Jewellers are based in the heart of Galway City, Ireland, the traditional home of the Claddagh Ring. A family run business trading since 1967, we are the makers of The Authentic Claddagh Ring. for regular promotions and updates.